When I owned a bakery, the staff and I tried our best to remember the names of our regular customers, not only because it was good customer service to greet someone by name but because it facilitated back of the house communication when discussing a particular order. Sometimes, however, it was hard to figure out what a customer’s name was. They either always paid with cash, so we couldn’t glance at a credit card, or they ordered something that was readily available from the bakery case, such as a muffin or a cookie, so we didn’t need to write an order slip. Or sometimes we just forgot. So, we developed an internal dialogue of descriptors for our regulars until we were able to determine their names. There was “Moby”, who strongly resembled the singer by the same name and who always ordered the turkey meatloaf sandwich. There was “Ski Slope Couple”, who, despite living in Las Vegas, always looked like they had just returned from the slopes of Gstaad. There was Grumpy-Track-Suit-Blueberry-Muffin-Guy, who became less grumpy over time, and who always ordered two blueberry muffins. Then there was the scone crowd. This was where it got tricky, because we were known for our great scones (let’s face it, there are a LOT of bad scones out there.) There were so many regular scone customers that we had to get specific with their descriptors: Double-Vanilla-Latte-and-a-Scone-Lady, Scone-Guy-Who-is-Some-Sort-of-a-Doctor, Pecan-Praline-Scone-Couple, Heated-Blueberry-Lemon-Scone-Girl…….etc., etc. 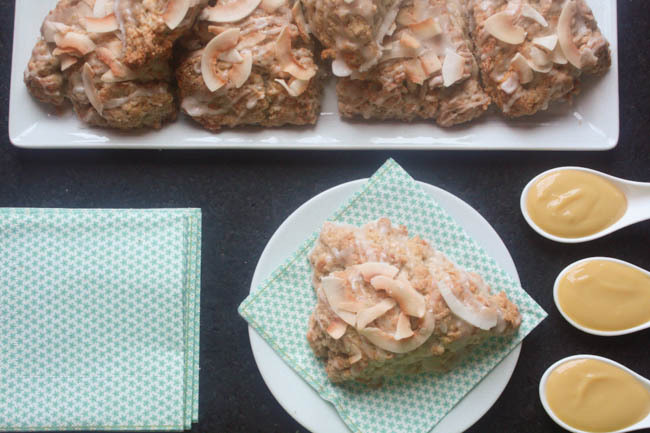 If I had been a customer at my bakery, I might have been referred to as “Toasted Coconut Scone Girl”, or maybe even “Girl Who Always Buys The Entire Batch of Toasted Coconut Scones”, that is, if I had created this recipe back when the bakery was open. 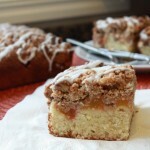 On that note, why didn’t I create this recipe back when the bakery was open? To say that I was “pleased” with how this baking experiment turned out would be a massive understatement. 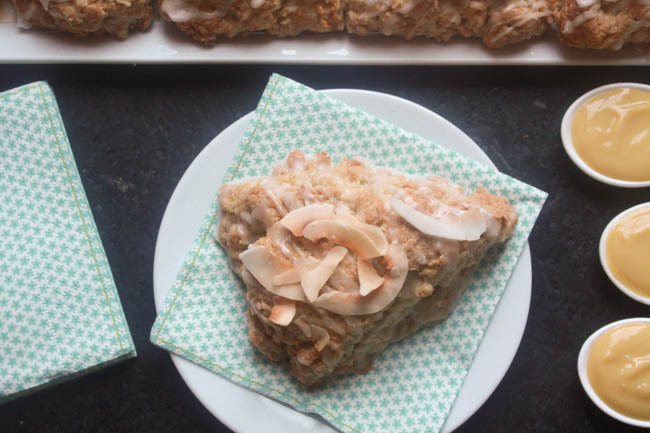 Buttery and moist, these tasty triangles pack a triple punch of coconutty goodness, from the coconut and coconut milk in the scones themselves to the sweet coconut glaze and the toasted coconut chip topping. 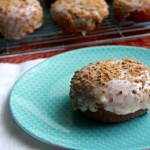 For any coconut lover, like yours truly, they are a must. 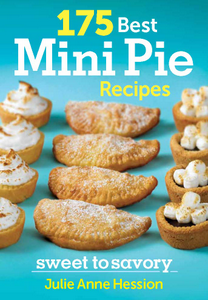 Run–don’t walk, skip or sashay–to the kitchen and make them NOW! Because scones are sometimes accompanied by a lemon curd, I decided to punch up this recipe a bit by making a mango curd from a bottle of “Orange Mango” Naked Juice that I had in the fridge. 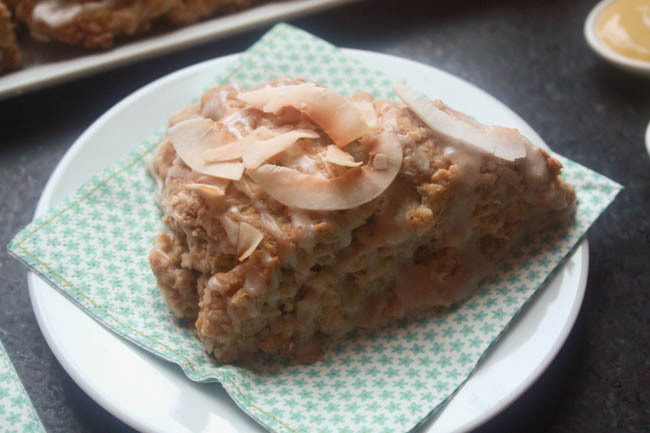 It provided just enough tartness to cut through the sweet glaze, but the scones also stand perfectly well on their own, so the curd is by all means optional. 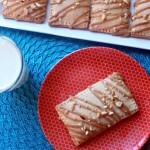 Serve them for breakfast, brunch……or nibble on one as you type up a blog post, as I may or may not be doing right now. 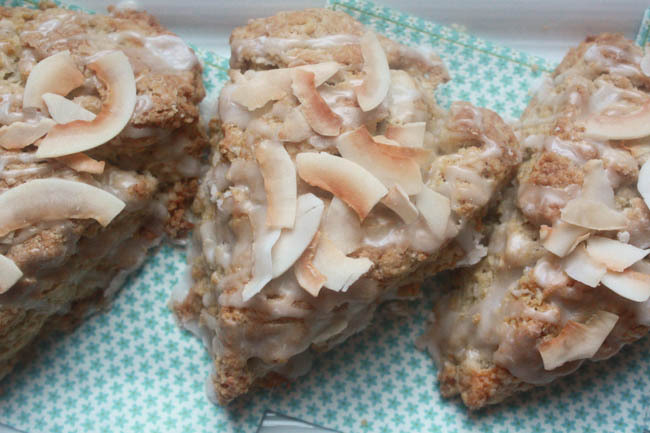 These moist, heavenly scented scones are a coconut lover's dream! 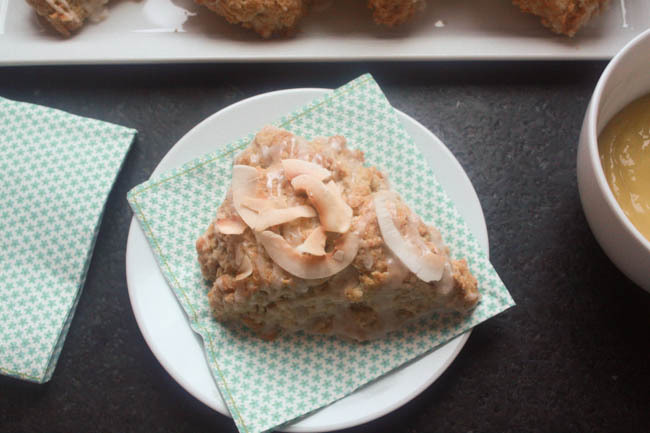 Toasted shredded coconut and creamy coconut milk are ingredients in the scone's batter. 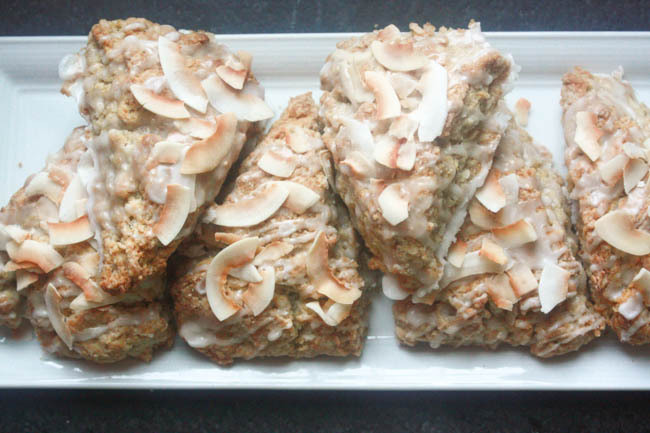 The baked scones are then drizzled with a sweet coconut glaze and topped with toasted coconut chips. Tart mango curd, served on the side is the perfect companion to these irresistible treats. Prepare the curd: In a small saucepan, whisk the egg and egg yolks with the sugar until well blended. Slowly whisk in the mango and lemon juices and place the saucepan over low heat, whisking constantly for 12-15 minutes until the mixture thickens. Remove the saucepan from the heat and whisk in the butter until smooth. Transfer the curd to a bowl, cover and chill until ready to serve. Prepare the scones: Preheat the oven to 400F/200C , placing racks in the upper and lower thirds positions. Line two baking sheets with parchment paper. In the work bowl of a food processor, pulse flour, coconut, baking powder, baking soda, cinnamon and salt until blended. Add the butter cubes and pulse 10-12 times until the mixture resembles coarse meal. Transfer the mixture to a large bowl. In a medium bowl, whisk together coconut milk, eggs, coconut extract and vanilla extract. Add the wet ingredients to the dry ingredients and mix until just combined and the dough begins to stick together. Turn the dough out onto a lightly floured work surface and divide into two equal pieces. 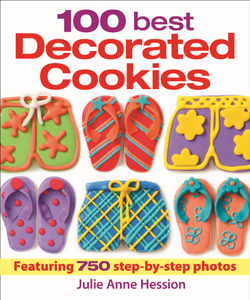 Shape each piece into a round about 1-inch (2.5 cm) thick. Using a pizza cutter or a chef's knife, cut each round into 8 equal wedges. Transfer the wedges to the prepared baking sheets, spacing apart. Bake the scones until golden brown and firm to the touch, switching positions of the baking sheets halfway through the baking process, 20-25 minutes. 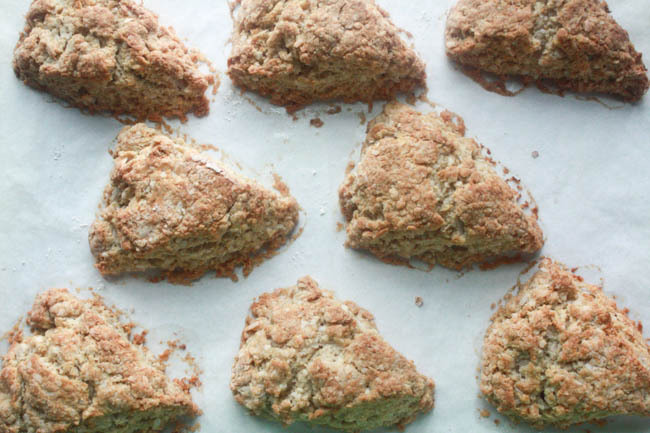 Let scones cool at least 10 minutes before glazing. 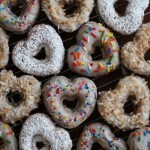 Prepare the glaze: In a medium bowl, whisk confectioner's sugar with enough coconut milk to get a thick but pourable glaze. Whisk in the extract. Drizzle the glaze generously over the tops of the warm scones. 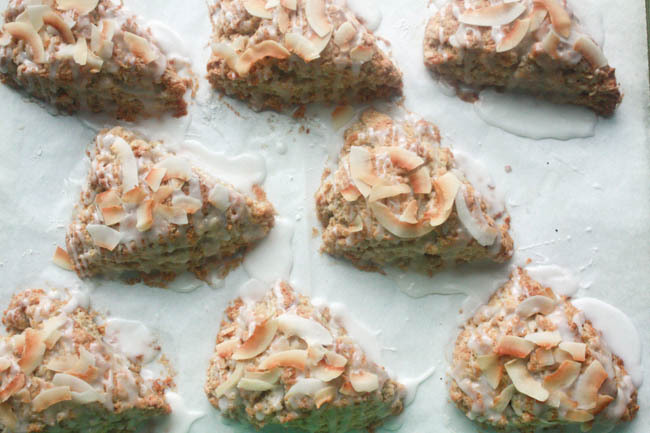 Sprinkle each scone with some of the toasted coconut chips. Let the glaze dry at least 10 minutes before serving. If you can't find mango juice, you can always substitute a bottled juice blend, such as "Orange Mango" from Naked Juice -- that's what I used! To toast coconut, spread it in an even layer on a baking sheet and bake a 300F/150C until lightly browned and fragrant, 8-10 minutes. Coconut chips are large unsweetened flaked pieces of coconut, and they can usually be found in the natural foods bins in your grocery store.